In Venice, in 1281, the “baretèri” and “capelèri” were already associated with other “Mariegole” or guilds of craftsmen who made clothes. 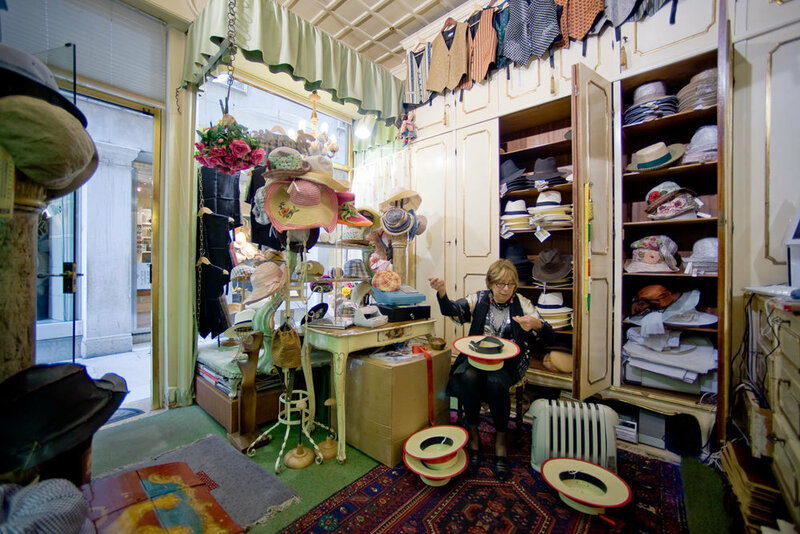 The “baretèri” are the hat makers who make summer hats and winter caps for gondoliers. “Baretèri”and capelèri” used “pani de lana” (wool cloth) and “paja de Marostega” (straw from the town of Marostica), which was used throughout the Veneto area, made of either wheat or willow and called “trucilo”. It was not until after the French Revolution that the trade became specialised, with the division between “cappellai” for men and “modiste” for women. In Venice, in 1281, the “baretèri” and “capelèri” were already associated with other “Mariegole” or guilds of craftsmen who made clothes: “marzèri” (haberdashers), “sartòri” (tailors), “verotèri” (furriers), “guantaie” (glove makers). They became independent in 1677. Traces of the hat-making tradition can be found in Venetian place names such as “Ponte dei Baretèri” and “Sotoportego del Capelèr”.